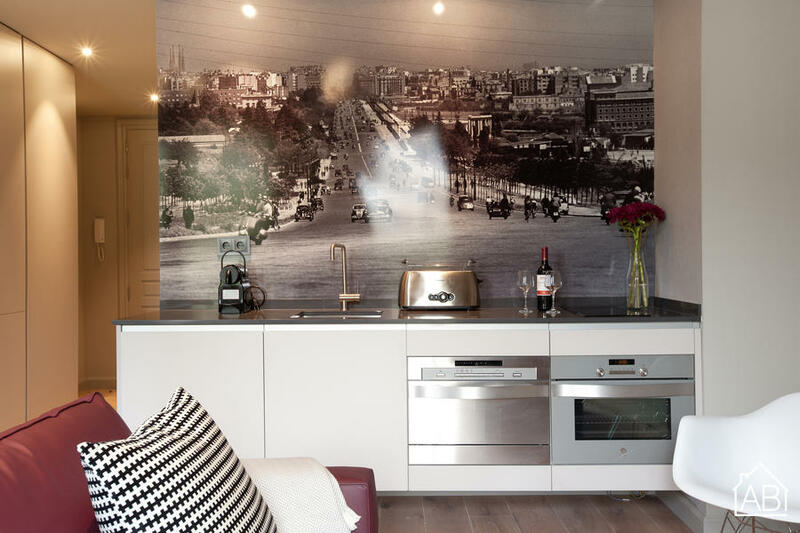 This modern apartment is located in the trendy Eixample neighbourhood of Barcelona. Situated between a plethora of public transport services and some of the best sights, this Barcelona apartment is in an ideal location for those wishing to enjoy the very best of the city. It is close to the bustling Las Ramblas, Plaça Catalunya, and Plaça Espanya, home to one of the city’s largest convention centres and the colorful Montjuïc Magic Fountain, amidst other top attractions and delicious eateries. Designed with a homey feel, this luxurious apartment comfortably sleeps up to 4 people. The apartment includes 2 bedrooms and 2 bathrooms making it an ideal place for a family or a group of friends. The state of the art kitchen comes fully equipped with the highest quality appliances, allowing you to prepare your favourite meals. On the ground floor of the recently restored building you will find a 24 hour reception and concierge service should you need anything at all. The building is also equipped a 150m2 communal terrace, complete with sun loungers, and security cameras are installed throughout, ensuring peace of mind during your stay and there’s also Internet connection. Complete with air conditioning and heating, this luxurious apartment is the perfect Barcelona home at any time of the year.